Missing Photo! A photograph was here! Don’t know where it went! My cousin Debbie sent me birthday presents! And my favorite kind!! Old photographs. This one is of my mother (dyed blonde!) my grandmother, and me, at 11-years old. A flood in the basement of the house where I grew up destroyed all the family photographs that were stored there. As a result, I have only a handful of pictures of myself growing up. I’ve got a couple of me as a baby and a toddler, and one when I was 12-years-old. I have a bunch from 16-years-old on, because my father bought me a camera then, and I went nuts taking pictures, and making albums and I had those with me. So this picture of me at 11, is one of maybe six photographs that I know of that exist of me before I turned 16. 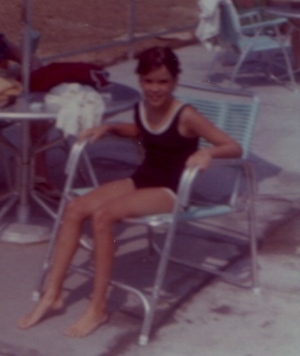 I was a pool rat. I spent every day that I could in the water. The conversation between me and my mother is probably going something like this.